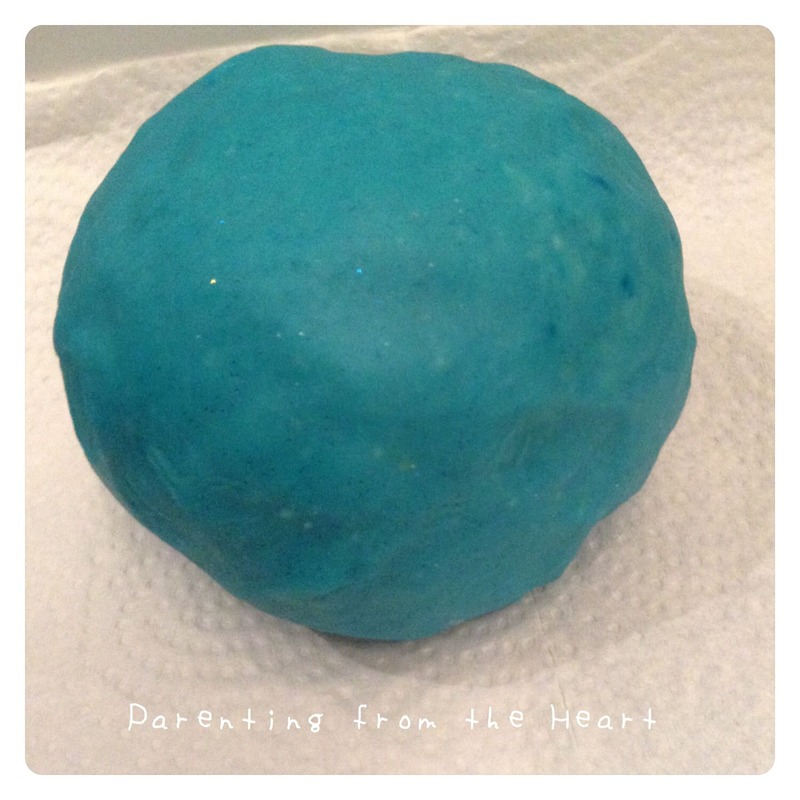 As you can tell from previous posts, we love making play-dough in our household. It’s such a simple medium that ends up being so rich experientially. 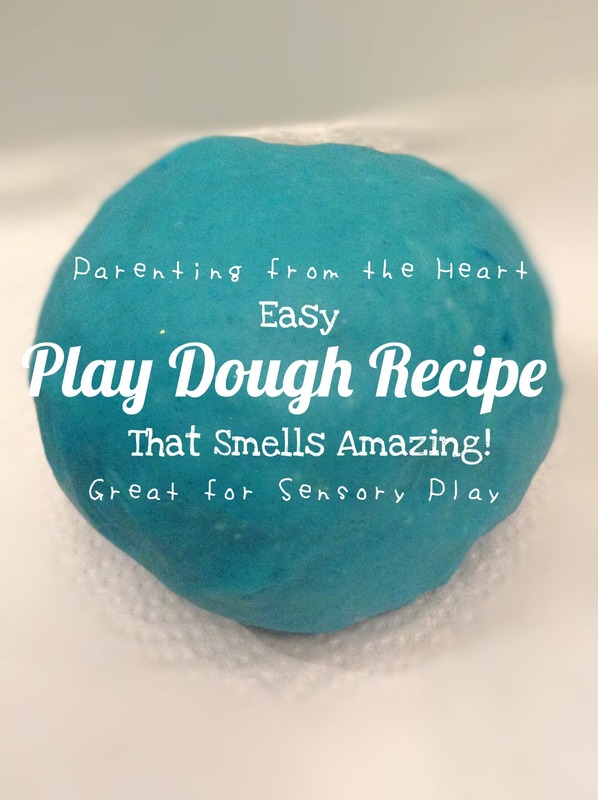 I could probably write an entire post just on the many educational aspects of play dough… Instead, I’ll just say, I particularly like this recipe because it’s vibrant, smooth, and smells great meaning it is ‘extra-sensory’ sensory play. The recipe is a derivative of one from Modern Parents, Messy Kids which you can also find on my Rain Days, Runny Noses post. Put water in a small sauce pan to boil. In a medium to large sauce pan, combine all other ingredients. Move large sauce pan to stovetop and set it to medium heat. Fold in water using a wooden spoon and continue to fold until well combined. Use as much food colouring to reach desired colour. If you happen to have little helpers making this with you, or if your kids find your food colouring when you’re not looking (pictured below), you need this hack. Put any shaving cream on the dyed spot, or entirely covered toddler, let it sit, rinse off! 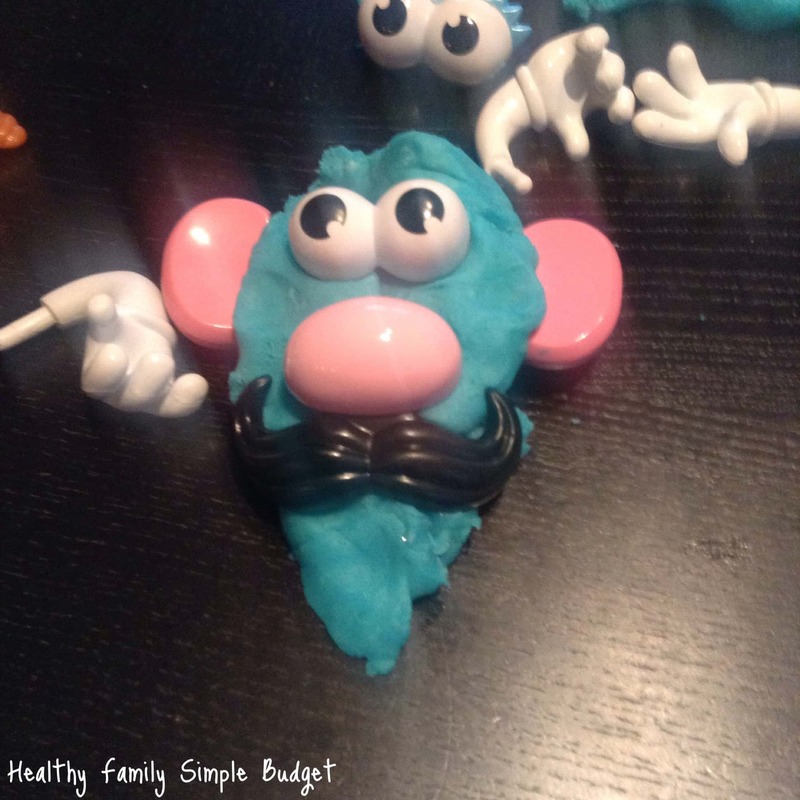 There are countless things you can do with play dough without buying play dough kits from a toy store. Here are some of our latest favourites. 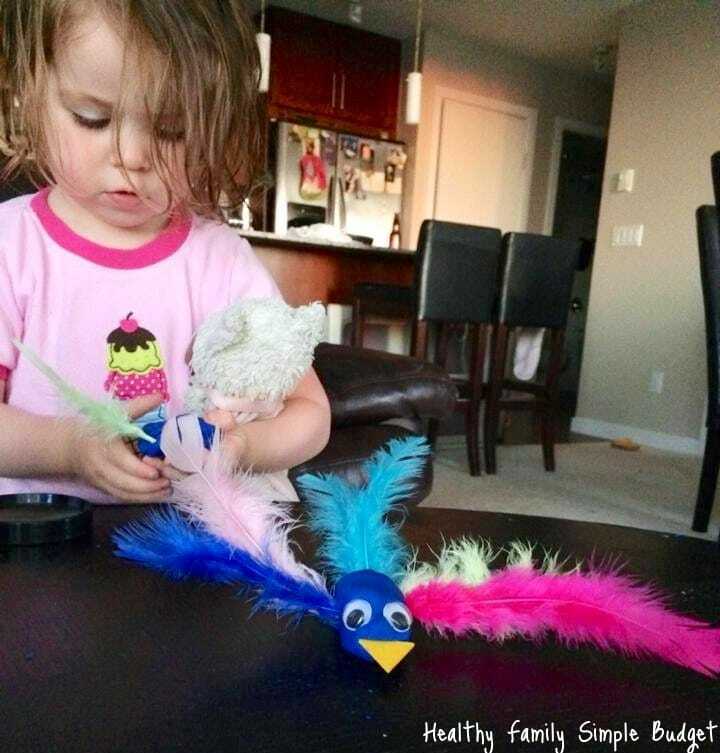 This is great for hand-eye coordination and fine motor skills. What we use: feathers, googlie eyes, wooden coloured shapes (in total, these costs less than $5 from the dollar store). We make birds, or I just let the kids fill their serving of play dough with the feathers. I got this idea when I wanted to bring some toys on vacation, but not a lot. Bringing both play dough and some Mr. Potato Head pieces had my kids thrilled the first time and every time I decide to pull this combo out. Hope you enjoy this recipe as much as we do time and time again! So great! We made although once and I didn’t love how it turned out so I’ll have to give this one a try for sure. These are great ideas! And as always, voted ? Haha. It took me more than one read to notice the mistake. Although 😛 it is a great recipe and it smells good too! I’ve been meaning to make play dough forever! I’m going to pin this so I’m sure to use this recipe! Love the pic with the blue little lady-so awesome! Haha. She REALLY surprised me that day 😛 thanks for pinning, Tarynn! I really appreciate it! Hahaha. It was QUITE the surprise finding her that way! Hope you enjoy this recipe. It’s GREAT fun!!! Haha. Believe it or not, that was after bath #1. Bath #2 w/ shaving cream solved the problem! 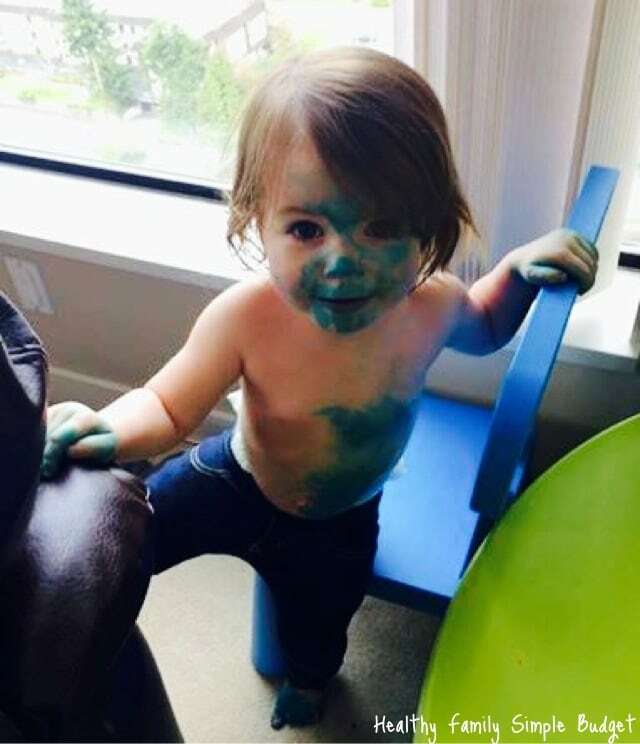 your little smurf baby is adorable!! haha! I will have to try that shaving cream trick! How fun! And thanks for the extension activities and shaving cream hack. The shaving cream hack is a must to keep in your back pocket for a rainy day!!! Thanks, Melissa! Awesome love the blue face. It’s going to be a cold weekend here in Florida, so this will be on the activity list. Thanks for sharing. That’s so awesome! It’s definitely COLD up here too. Hope you enjoy!!! Will update my old recipe that was missing the Jello!! 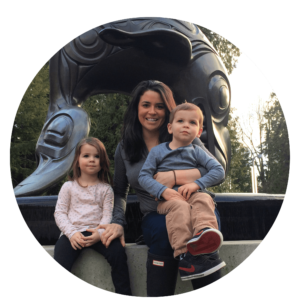 Your site is a great read for Grandmas too. Thanks Diane! Jello makes it smell so good!